Sir Robert was a nineteenth century Irish astronomer who became Astronomer Royal for Ireland and later worked at the University of Cambridge where he had special accommodation built for his extensive family. His observational astronomy days ended prematurely after removal of one of his eyes, but he made significant contributions to mathematics and particularly to the popularization of astronomy through his many books. Mark Hurn is librarian at the Institute of Astronomy so has access to a number of old books written by Ball which he brought along to the meeting to show us. Mark made the point that it is fascinating to read about past astronomical theories in the light of our present knowledge. 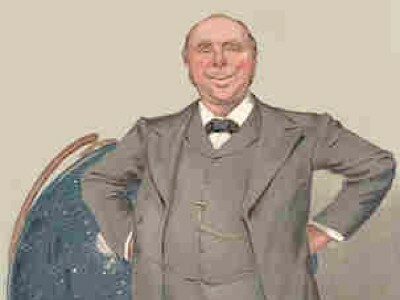 Ball, for example, believed that meteorites came from earth, not from the solar system and argued his corner vigorously. We now know of course that many of these objects come from Mars, but one can imagine how this might have been difficult to envisage over 100 years ago. Sir Robert Ball died in 1913 and is buried in Cambridge in the Ascension Parish Burial Ground, near Storey’s Way.